Sai Baba Mandir Lodhi Road is one of the oldest temple of Delhi. The temple is located on Lodhi road, and it is present roadside. Many devotees pays their visits to this temple. The maximum rush can be seen on the thursdays, when people pays their offerings and seek peace. The temple is maintained by Shri Sai Bhakt Samaj, Delhi. It was established in 1968, and since then the temple is looked after by this organisation. Many Prashad shops and accesories are present near the Sai temple premises. These shops sell offerings, idols, lockets etc, the items related to Sai Baba. Lodhi Road Sai Baba Temple has shoe stall, where shoes can be kept free of cost. Near to the shoe stall, hand wash facility is also present. The main Sai Baba Idol is made up of white marble. Sai Mandir Lodhi Road is at a height from the road, and the stairs are the way to temple. Beggars are also found sitting outside the Mandir gate. Temple also has first floor and it has space for people to sit, if someone wants to spend some time there in prayers. Sai Baba Mandir Lodhi road stays open all days of the year. 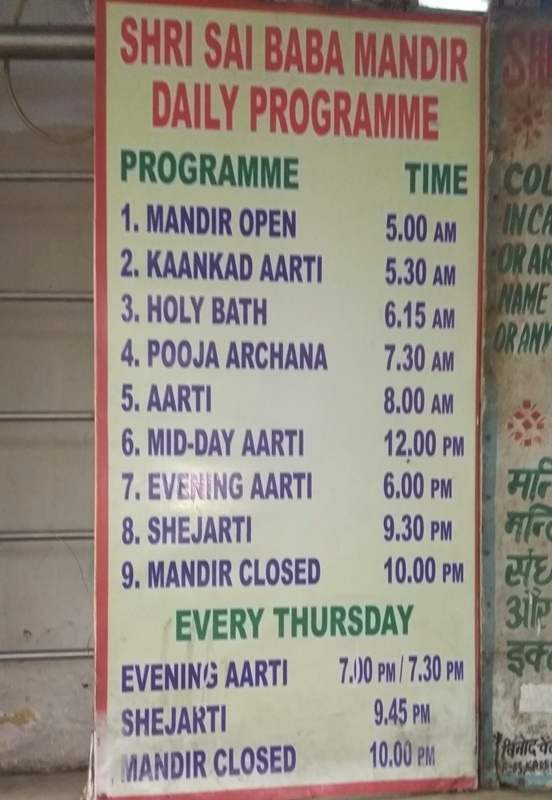 Lodhi Road Sai Baba temple opening timing is 5 AM and closing timing is 10 PM. Aarti happens at various hours of the day, when people can mark their presence. Kaankad Aarti starts at 05:30 AM in the day, after which Holy Bath is performed at 06:15 AM. Sai Baba Pooja Archana starts more than an hour later, at 07:30 AM. Aarti timing is 08 AM, after which Mid-Day Aarti happens at 12 PM. Later in the day, evening Aarti starts at 6:00 PM, followed by Shejarti at 09:30 PM. Thursday Aarti timing of Sai Baba temple is different, the evening Aarti varies from 07:00 PM to 07:30 PM. Thursday Shejarti is delayed by 15 mins, and it is performed at 09:45 PM. Sai Baba Mandir is situated at Lodhi road and it is present along road, so a lot of devotees offer their prayers from outside. The Sai baba Idol can be seen from outside only. The temple is very much is reach, by personal conveyance, bus as well as metro. The nearest metro station is JLN station, which is under 500 m of walking distance through the residential complex. The driving distance is around 1.5 KM from there. The nearest bus stand is Pragati Vihar, and bus which halts here are 173, 375, 440A, 450, 623, 623A, 623B, 623EXT etc. It is located at a distance of 1.2 KM from Lodhi Garden. The complete address of the Sai Temple is : 17, Institutional Area Lodhi Road, Delhi. Also check Akshardham Mandir, Birla Mandir, Iskcon Temple, Hanuman Temple CP, Bangla Sahib Gurudwara, Chhatarpur Mandir, Kalkaji Temple, Jhandewalan Mandir, Sai Baba Temple Najafgarh.